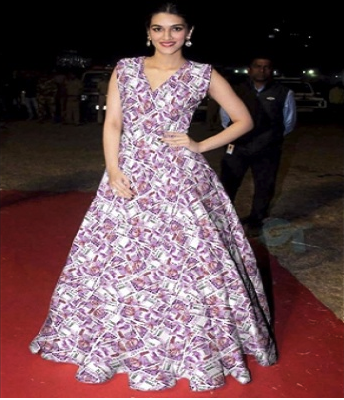 Rs 2000 Note Dress by Kriti Sanon: Bollywood Actress Kriti Sanon, who made her acting debut with Prince Mahesh Babu in Telugu movie ‘1-Nenokkadine’, and Bollywood film “Heropanti” and Shah Rukh starrer “Dilwale” is treading on the internet grabbing the attention of everyone with her latest appearance. Recently Kriti Sanon was spotted wearing a dress that had the newly launched RBI Rs. 2000 printed over her dress. We have seen celebrities wearing dress that with prints of flags, animals, and even picture of country’s PM. But Kriti Sanon unique dress caught the attention of everyone and is viral over the internet. Many people call it as a fresh fashion statement. While others were criticizing it as she had made a fun of the demonetization which has been rolled out by the central government of India. The Dilwale actress pics sporting the Rs 2000 note are currently going viral on social media while receiving comments as well as compliments. The Dilwale Actress is busy in shooting her upcoming movie Raabta which stars actor Sushant Singh Rajput and Kriti Sanon. Raabta will hit the theaters on June 9, 2016. Directed by Dinesh Vijan the movie is entirely shot in Mauritius, Budapest, and Punjab. The movie which was supposed to release during Valentine’s Day next year but postponed to avoid the clash with Akshay Kumar’s Jolly LLB 2. For More Updates, Follow WORLDHAB.